It makes me feel like there is 2 opinions in this room and we can discuss out opinions between each other and have a civil discussion. SAME BACK TO YOU WHY DO YOU HAVE AN OPINION! BECAUSE YOU HAVE AN OPINION!! Why dream when you can meme? "Your comment will appear after it has been approved"
BECAUSE YOUR OPINION ON THE TOPIC OF MY OPINION IS STILL AN OPINION AND I HAVE AN OPINION ALREADY!!!! my opinion on the topic of opinions in this opinion based thread is not the same opinion as your opinion but rather my own opinion on your opinion but thats just my opinion. 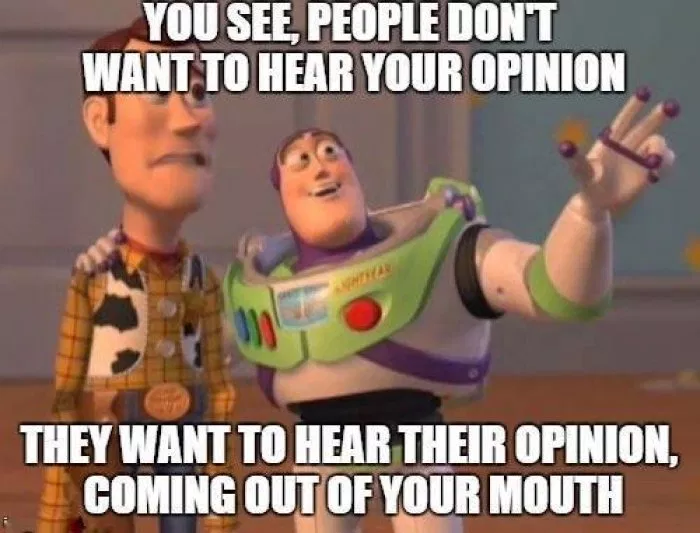 no my opinion of your opinion in this opinion based thread in which you commented they you had an opinion on my opinion but asked my my opinion of your opinion is not your opinion or based on your opinion to my opinion thread and opinions of your opinions my opinion is mine and not your opinion nor a reaction of your opinion because its my opinion. well my opinion on your opinion on my topic of opinion based opinions and the opinions we share the the opinions that are our own opinions is that my opinion is not anyone's opinion nor is my opinion similar to anyone's opinion as it is my opinion although my opinion on your opinion to my latest opinion is still just an opinion on my opinions opinions you see? so thats my opinion on this opinion in this opinion topic and i understand your opinions of many opinions and appreciate your opinions of my opinions in the is opinion but of course thats just my opinion.